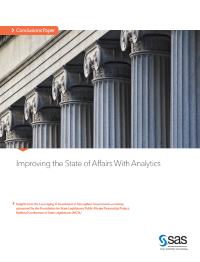 Download this case study-rich white paper to learn why data management and analytics are so crucial in the public sector, and how to put it to work in your organization. Public sector organizations of all types and sizes generate and encounter an unprecedented amount of data coming at them from all directions—citizens, businesses, government agencies and departments—and encompassing countless areas. But without a fast and reliable way to capture and understand this big data, these organizations cannot hope to operate efficiently. Many states have been able to use data and analytics to make governing more effective, strengthening fraud detection, enhancing child welfare services and improving health outcomes. They have shown that it can deliver citizen services faster and more cost effectively, and that it can boost public safety.